There are many things that you must see or do in Montgomery, Alabama. And dining on Steak-Out is a must that should be added to that list. 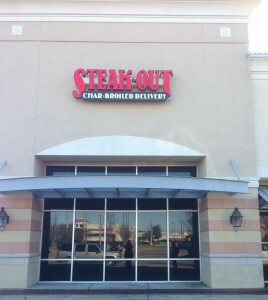 The Montgomery, AL Steak-Out serves up traditional as well as larger sized cheeseburgers that our customers rave about. You also need to try our mouth watering steaks, grilled chicken, and crisp salads. Don’t forget to save room for our moist, creamy NY Style Cheesecake. If you live in the Montgomery area, or are just in town for a visit, make sure you cross a delicious meal from Steak-Out off of your must-do list. Swing by the restaurant to pick up your order or have it delivered straight to your front door. Our online ordering system makes it even easier to enjoy a meal from Steak-Out.